Highlight is 42” at the withers and his “fighting weight” has stabilized in the 260-275 lb range, although he will quickly drift above 300lbs if his feed intake isn't regulated. 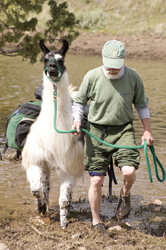 He has all the necessary conformational attributes for a working llama as verified by his easy ability to keep up with longer-legged handlers. Highlight is an outstanding “idiot detector” — he invariably “outs” the clueless types who are brainlessly hung up on size, size, and more size ... as if looks cancel out function somehow!?!?! Gwen was originally intending to play with Highlight, but Highlight had already bonded with and chosen Jim during a Get Connected! clinic at Bobra Goldsmith’s farm, and they solidified that relationship while traveling here from Colorado. Oh, well. Highlight is the only offspring of High Spirits, and also the only male offspring of Puzzle (dam of Dazzle). We had wanted to lease High Spirits for breeding to some of our females, but the distance between here and Colorado coupled with High Spirits’ frequent use for packing, public relations outings and showing made that an impossibility. Our initial disappointment at not being able to lease his sire has been forgotten, thanks to the privilege of having Highlight here for the rest of his life. We appreciate Highlight’s many superior qualities, not the least of which is that he is one of the easiest animals to manage on our farm. Highlight was awarded his PLTA Master Pack Llama certification with (as per our own requirement for stud prospects) no special conditioning or preparation. Highlight’s superb disposition and innate intelligence are no surprise to us (both run deep in his ancestry), and they definitely make him a real treat to work and play with. Highlight’s excellent muscling, superior bone, tight and properly-proportioned structure (no trendy, unbalancing over-long neck here), lightness on his feet and above-average gaits all combine to create a stout, athletic, superior physical working package. Highlight's coat is his one negative trait. We didn't like the long guard hair, but upon Highlight's arrival, Jim completely and easily combed out Highlight's undercoat and we were ecstatic. But that was the only time — we were fooled by a wool break — Highlight is actually a curaca llama, not a classic. However, his coat does have the highly desirable (and rare) sparseness of undercoat that is important for health and grooming ease, and he does pass that on. We were pairing Highlight very, VERY carefully with our standard (short) coat Classic females on a limited basis — because his other working genetic traits are just too awesome to discard. Regardless of the reason or the potential for future improvement in his fertility, we have accepted that is it quite possible Highlight might not sire another offspring. We will be retaining all three of his progeny to date for our own breeding program. They have all inherited his total athletic package, stellar disposition, cooperation and intelligence. (And, for what it's worth, all are taller than Highlight himself; two rather substantially so). To say that we are extremely pleased with all three would still be an understatement! This illustrates precisely why we have been extremely vocal about the push to eliminate llamas from breeding based on small size. The gene pool is small enough without removing highly capable llamas from it ... especially for "reasons" that don't hold up. Highlight was probably named to reflect his sire (High Spirits) and perhaps it was also an intentional oblique reference to his maternal half-sister (Dazzle). Regardless, Highlight certainly is one of the highlights around here! Note: At this particular set of trials, Highlight and Gwen started out in the lead at their usual trail-eating pace, but had to move to the middle solely due to another handler's insistance that his own llama needed to be in front. Highlight and Gwen were literally up the other (slower) llama's backside. Finally Gwen got completely fed up (and SORE) with being smashed when the leading llama abruptly stopped to eat — OFTEN — whereupon Gwen ran into him HARD followed by Highlight not being able to stop fast enough and thus plowing into her. Gwen and Highlight tried the end slot (the only remaining option in a group of three), but were too fast and too close to Credo to avoid all kinds of spit threats. The only solution to keep the peace was to hold Highlight back a LOT and then continue far out of Credo's trigger zone, stopping periodically to maintain that distance. At the end of the trial, the handler of the other llama (the one who HAD to be in the lead) declared that Highlight was always far behind Credo and his own llama, and that this was because Highlight was too short to keep up. Moral #1 — don't believe everything people say about "short" llamas; they may have already decided what they are going to see and never actually looked at the total picture. Moral #2 — Not all MPL certified pack llamas are equal! Highlight proved he could (1) keep up (actually that he can go faster), (2) refrain from snacking on the trail, and (3) accept being in the lead, in the middle, or bringing up the rear ... but he received the same "credentials" as the llama who could only be in front and snacked constantly.